Piramal Vama is a new tower launch at the Piramal Vaikunth project in Thane West by Piramal Realty. The project is sprawling over 32 acres of land. It is designed to sustain a fulfilling sense of community and provide a deeper connection with nature. 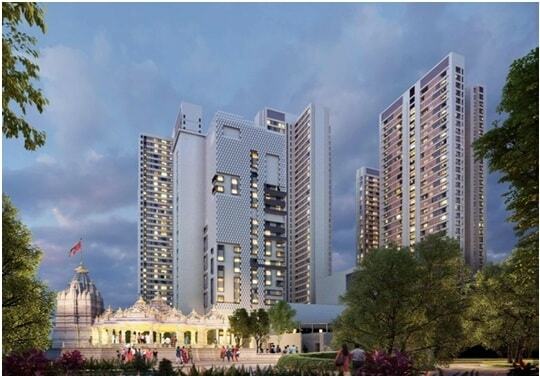 Piramal Vaikunth Vama has the apartments of 2 BHK configuration and 3 BHK configuration. The rooms are available in various sizes and they are planned and executed into spacious & well lit units. Piramal Vama a residential apartment is launched at Balkum, Thane West, Mumbai by Piramal Realty. Vama Project is positioned over 32 acres of land. Phase II launched at Piramal Vaikunth named as Vama is a perfect destination to live in style and comfort. Vama featuring 2 and 3 BHK luxury homes. Vama units area starts from 556 sq.ft. and available at Rs 89 lacs onwards. The location of Piramal Vaikunth Vama makes sure that the home-seekers are choosing the right Apartments for themselves. It is one of the most prestigious addressof Thane with many facilities and utilities nearby Balkum. Piramal Vama prelaunch Thane comes with full of comfort such as Lavish Sun-decks, Spacious Deck, Children Play Area, Organic Garden, Tulsi & Flower Garden, Green Building and Energy Efficient Electrical Fixtures. Piramal Vaikunth Vama is conveniently located in Baklum and enjoys close proximity to all social facilities.This new 29 storey tower is nestled within the Piramal Vaikunth Development at Balkum Area of Thane. Close to business districts like Powai (13 kilometres) and Andheri (19 kilometres). Thane offers the option of being close to Mumbai without spending a lot on lodging. The majority of the workforce here travels to Mumbai every day. Piramal Vama is phase II designed in Piramal Vaikunth and the project is located in Balkum, Thane West near Dosti Landmark. Out of the many world class facilities, the major amenities in Piramal Vaikunth Vama includes Landscaped Garden, Indoor Games, CCTV Cameras, Swimming Pool, Gymnasium, Play Area, Intercom, Lift, Club House, Library, Cafeteria, Convenience Store, Jogging Track, Temple, 24Hr Backup Electricity, Cricket Court, Squash Court, Senior Citizen Park, Multi-purpose Hall, ATM, Day care center, Service Lift, Super Market, Street Light, Security, Solar Water Heating, Creche, Yoga, Aerobics and Meditation Room, 24Hr Water Supply and Multipurpose Games Court. Schools: -Balloon Kids Pre School, Holy Trinity English High School, Eurokids International Preschool.Restaurants: - Antony Idli Center, Vihangkuber Hospitality, FBK = Food By The Kilo, China Express, Domino's Pizza, Sanman Pure Veg.Hospitals: - Krishna Hospital, Aditi Hospital, Currae Healthcare, Balaji Hospital.Parks: - Vasant garden, Johnson & Johnson garden, Lala Tulsiram Park.Movie Theatres: - Cinemax, Vandana Cinema Hall, Inox Multiplex.Banks/ ATMs: - State Bank Of India, Citi Financial Consumer Finance India, Andhra Bank, Axis Bank ATM, ICICI Bank ATM.